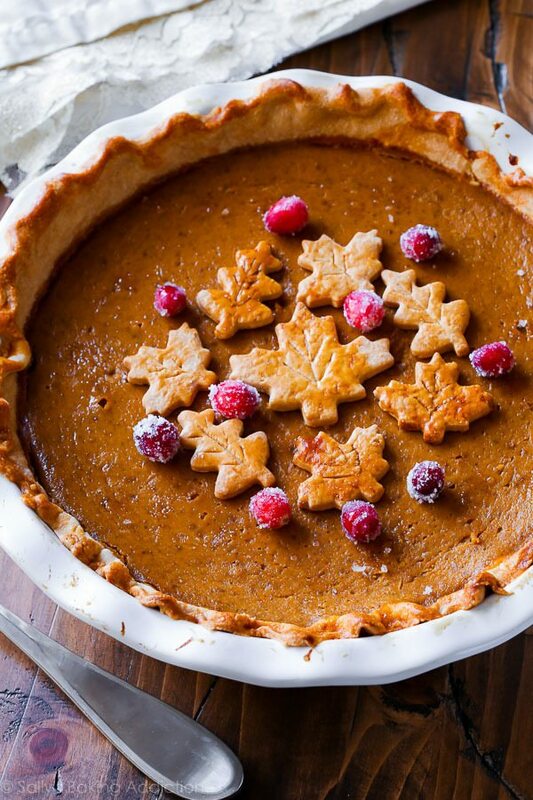 Bursting with flavor, this pumpkin pie recipe is my very favorite. 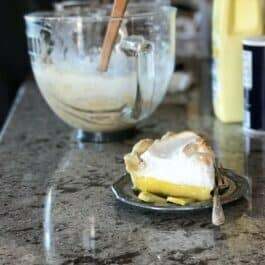 It’s rich, smooth, and tastes incredible on my homemade pie crust and served with whipped cream. 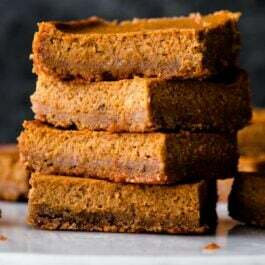 Pumpkin pancakes, pumpkin cookies, pumpkin lattes, pumpkin cupcakes, pumpkin bread, but HELLO what about pumpkin pie?? My Great Pumpkin Pie Recipe is here today. Say hi to this pie. I spent the majority of my incredibly awesome week last week testing pumpkin pie recipes. And when I say awesome, I really mean frustrating because testing the perfect pumpkin pie recipe is a lot more challenging than one would assume! Fresh pumpkin, canned pumpkin, ginger, no ginger, brown sugar, white sugar, cornstarch, flour, no cornstarch, no flour, and O-M-G how do I decorate it and make it look pretty for my blog? I made three of these pumpkin pies, just to be sure this recipe was the best of the very best. Let’s start with the pie crust. 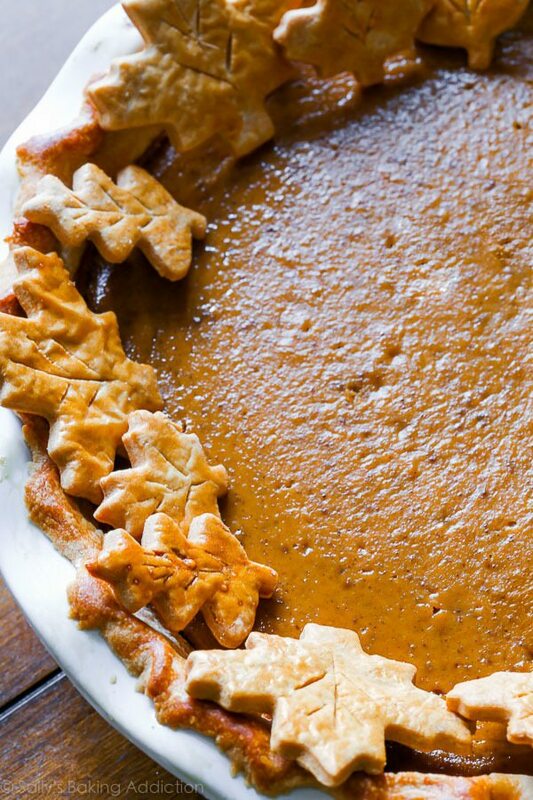 Every pumpkin pie has to start with a stellar pie crust. My homemade pie crust uses a mix of shortening and butter so you get the most buttery tasting, tender, flaky (so flaky) pie crust. It’s easy to make. And I have a ton of step-by-step photos here. Fresh or Canned Pumpkin in Pumpkin Pie? 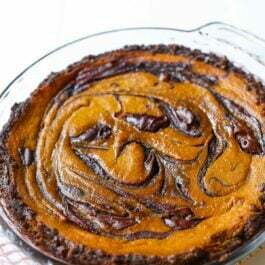 I tested this recipe with both and I truly liked the pie using canned pumpkin better. The canned pumpkin pumpkin pie (say that 3 times fast) was a little more sturdy when baked for the same amount of time. The pie baked with fresh pumpkin puree tasted grainy and a little… herbaceous? I prefer using fresh pumpkin puree in savory recipes, not desserts. This is your call, you can use either fresh or canned pumpkin. Eggs. Eggs set up the pumpkin pie filling. They give the filling its rich, luxurious texture. Heavy cream. Heavy cream makes pumpkin pie luxurious and silky smooth. It’s thick, creamy, and absolutely heavenly in this pumpkin pie recipe. I use 1 cup of heavy cream and 1/4 cup of milk. I found that 1 and 1/4 cups of heavy cream (or more) was simply too much. Too thick, too gloppy! You can also use the heavy cream to make homemade whipped cream for the topping. Cornstarch. A starch thickener is one of the most important ingredients in a pie filling. I use a touch of cornstarch in my pumpkin pie because it helps set up the pie. Makes it a little sturdier and firm, while keeping everything smooth. This sounds so incredibly weird. But I add freshly ground black pepper to my pumpkin pie filling. It’s bizarre, I know. But I’m being serious. I got this tip from the genius kitchen crew over at King Arthur Flour. And I am forever grateful. Because this little addition turns your pumpkin pie into the BEST pumpkin pie. No one will know it’s there! Except for you. And they will all be wondering how this spiced pie is so damn good. A pinch of pepper. Silky yet thick, this pumpkin pie cuts beautifully as long as it is baked for the right amount of time. The bake time is about 55-60 minutes. At this time, the center of the pumpkin pie will be slightly wobbly. It will set as it cools. Careful not to overcook; overcooking it will cause the filling to crack. So from my kitchen to yours, enjoy The Great Pumpkin Pie Recipe. 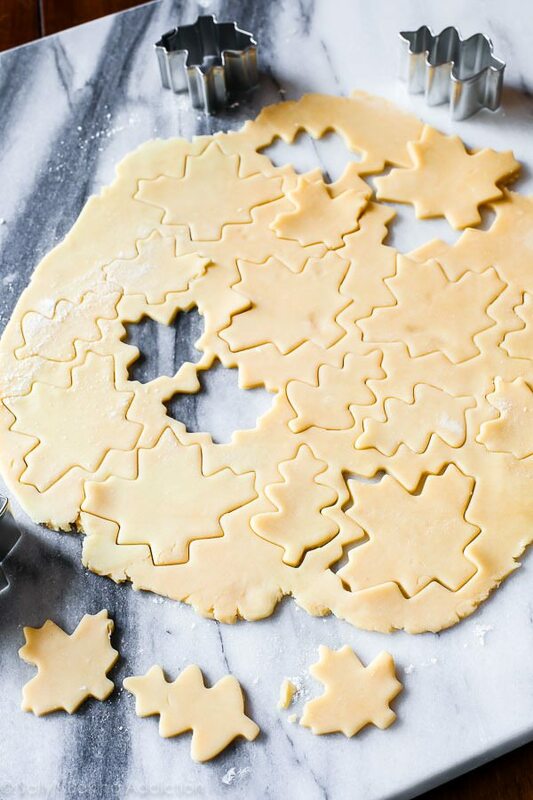 The pie crust leaves are purely for decor, you can leave those off of the pie and only make 1 pie crust. You can also leave off the sugared cranberries. 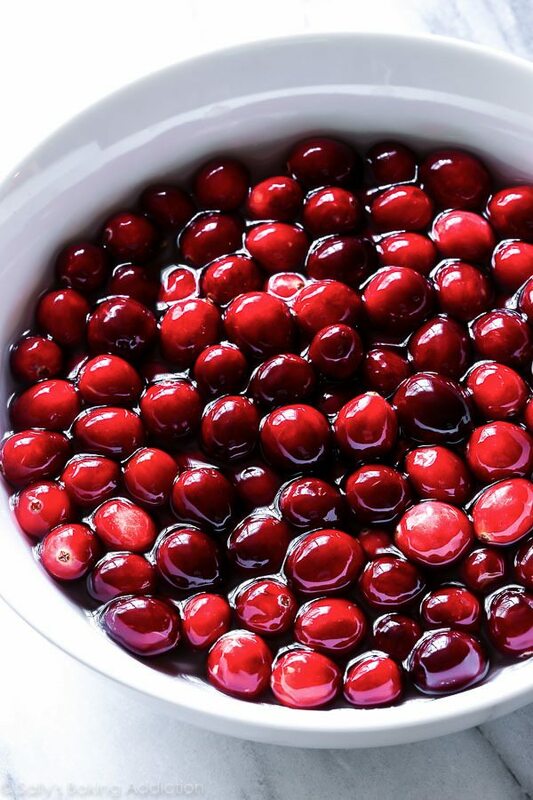 For the cranberries: Place cranberries in a large bowl; set aside. In a medium saucepan, bring 1 cup of sugar and the water to a boil and whisk until the sugar is dissolved. Remove pan from the heat and allow to cool for 5 minutes. Pour sugar syrup over the cranberries and stir. Let the cranberries sit at room temperature or in the refrigerator for 6 hours or overnight (ideal). You'll notice the sugar syrup is quite thick after this amount of time. Drain the cranberries from the syrup and pour 1 cup of sugar on top. 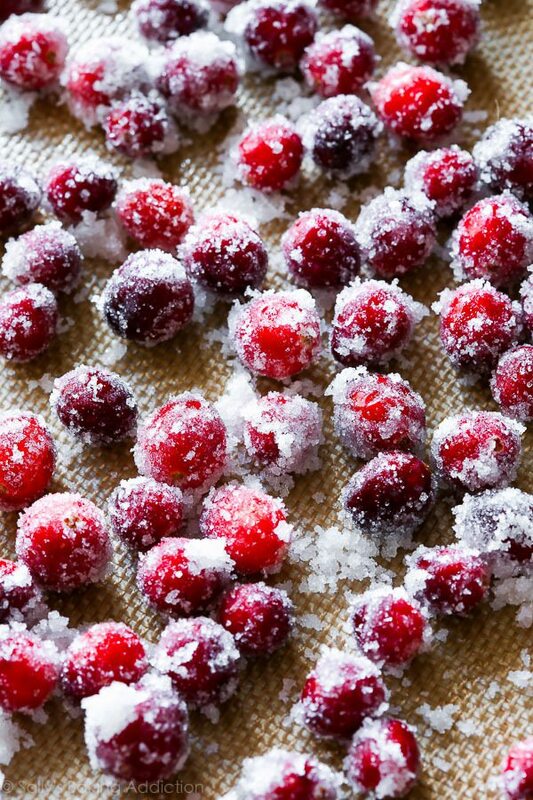 Toss the cranberries, coating them all the way around. Pour the sugared cranberries on a parchment paper or silicone baking mat-lined baking sheet and let them dry for at least 2 hours at room temperature or in the refrigerator. Make the pie crust through step 5 according to my directions, tips, and pictures. Or use store-bought. For the pumpkin pie filling: Whisk the pumpkin, 3 eggs, and brown sugar together until combined. Add the cornstarch, salt, cinnamon, ginger, nutmeg, cloves, pepper, cream, and milk. 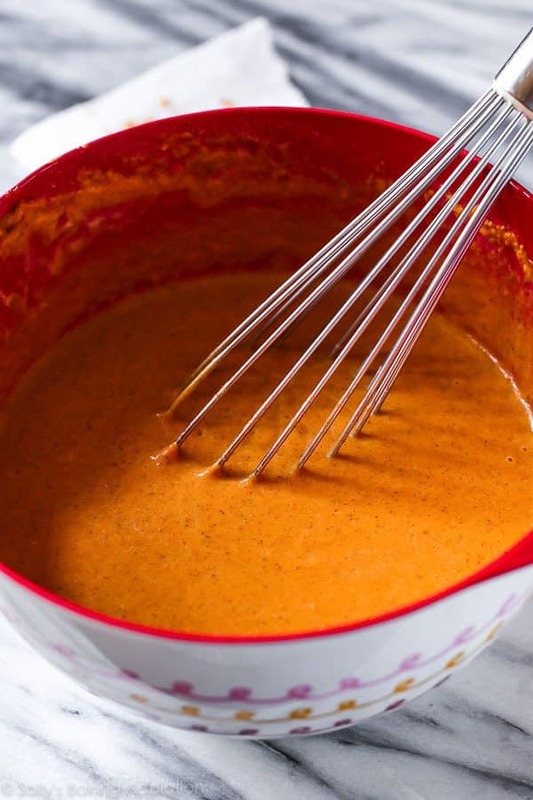 Vigorously whisk until everything is combined. Filling will be a little thick. 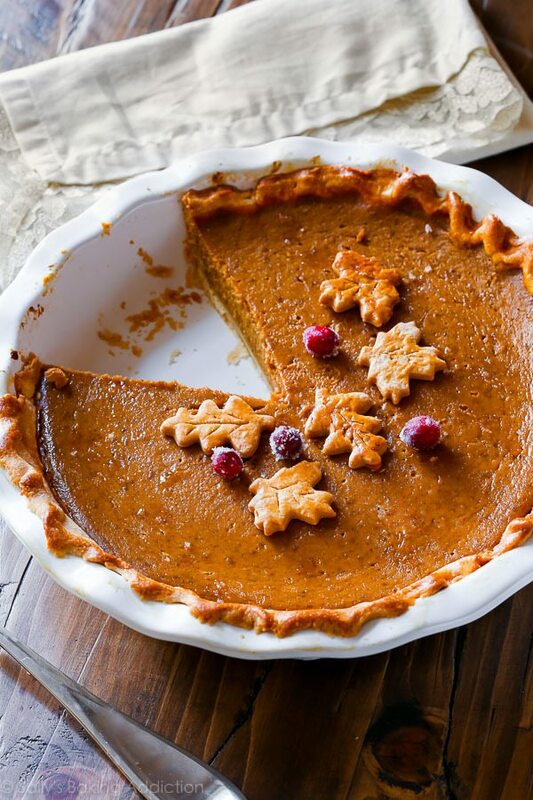 Roll out the chilled pie crust: Remove 1 disc of pie dough from the refrigerator. On a lightly floured work surface, roll the dough out into a 12-inch circle. Make sure to turn the dough about a quarter turn after every few rolls. Carefully place the dough into a 9-inch pie dish. Tuck it in with your fingers, making sure it is smooth. With a small and sharp knife, trim the extra overhang of crust and discard. Crimp the edges with your fingers, if desired. Brush edges lightly with egg wash mixture. Using pie weights, pre-bake the crust for 10 minutes. Pour pumpkin pie filling into the warm pre-baked crust. Only fill the crust about 3/4 of the way up. (Use extra to make mini pies with leftover pie dough scraps if you'd like.) Bake the pie until the center is almost set, about 55-60 minutes give or take. A small part of the center will be wobbly - that's ok. After 25 minutes of baking, be sure to cover the edges of the crust with aluminum foil or use a pie crust shield to prevent the edges from getting too brown. Check for doneness at minute 50, and then 55, and then 60, etc. Once done, transfer the pie to a wire rack and allow to cool completely for at least 3 hours. Decorate with sugared cranberries and pie crust leaves (see note). You'll definitely have leftover cranberries - they're tasty for snacking. Serve pie with whipped cream if desired. Cover leftovers tightly and store in the refrigerator for up to 3 days. Make ahead tip: Pumpkin pie freezes well, up to 3 months. Thaw overnight in the refrigerator before serving. Pie crust dough freezes well for up to 3 months. Thaw overnight in the refrigerator before using. 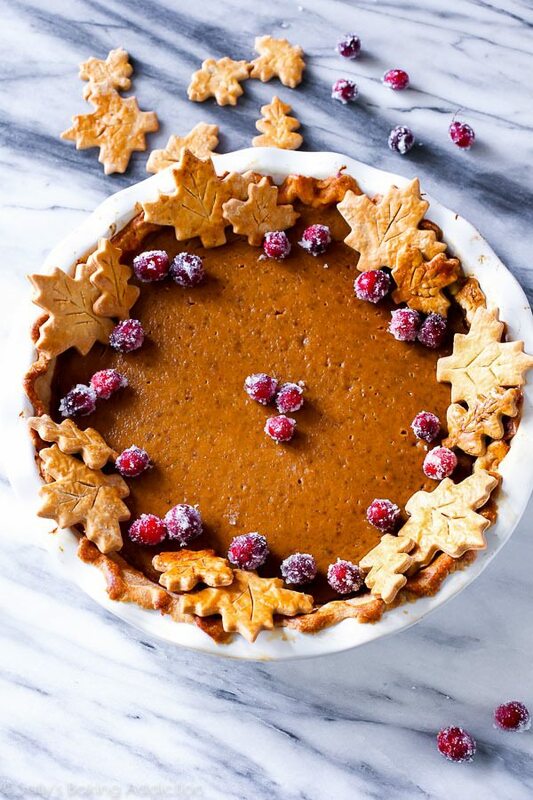 If decorating your pie with sugared cranberries, start them the night before. You'll also begin the pie crust the night before as well (the dough needs at least 2 hours to chill; overnight is best). The filling can be made the night before as well. In fact, I prefer it that way. 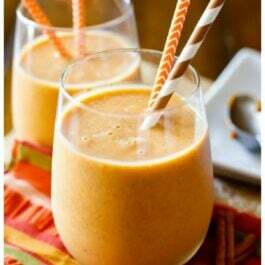 It gives the spices, pumpkin, and brown sugar flavors a chance to infuse and blend. It's awesome. Cover and refrigerate overnight. Fresh cranberries, not frozen. The sugar syrup doesn't coat evenly on the frozen berries, leaving you with rather ugly and some very plain shriveled cranberries! 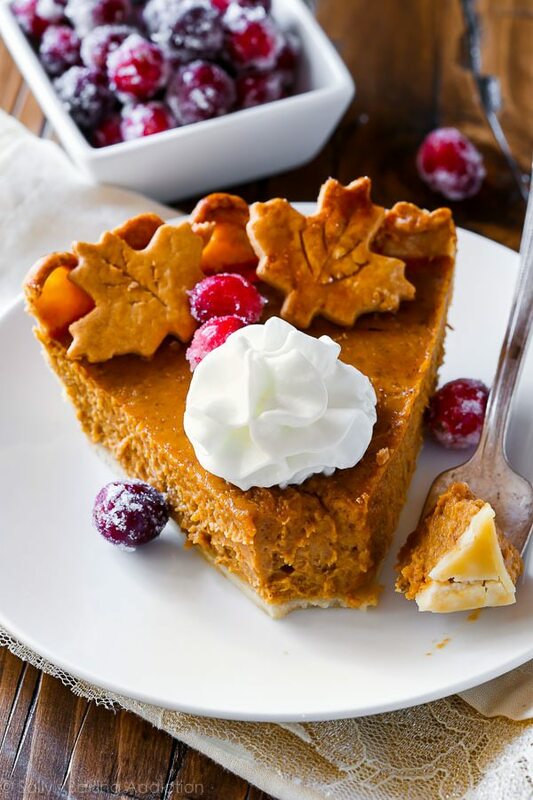 Canned pumpkin is best in this pumpkin pie recipe. If using fresh pumpkin puree, lightly blot it before adding to remove some moisture. The bake time may be longer. About 1 teaspoon of pumpkin pie spice can be used instead of these spices. For the pie crust leaves: On a floured work surface, roll out one of the balls of chilled dough (keep the other one in the refrigerator). Roll out into any shape you really want (doesn't matter) and 1/8 inch thickness. 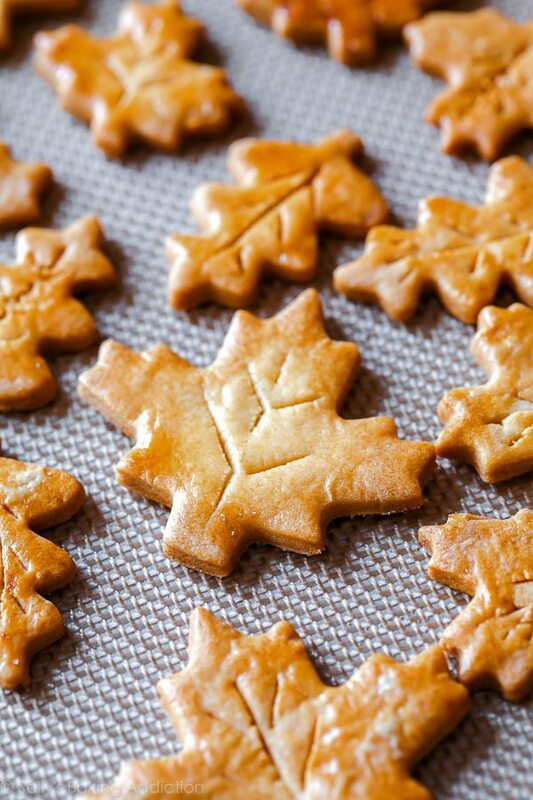 Using leaf cookie cutters, cut into shapes. Brush each lightly with the beaten egg + milk mixture. Cut leaf veins into leaves using a sharp knife, if desired. Place onto a parchment paper or silicone baking mat-lined baking sheet and bake at 350°F (177°C) for 10 minutes or until lightly browned. Remove and set aside to cool before decorating pie. Pie crust leaves are easy. My pie crust recipe makes enough for two crusts. 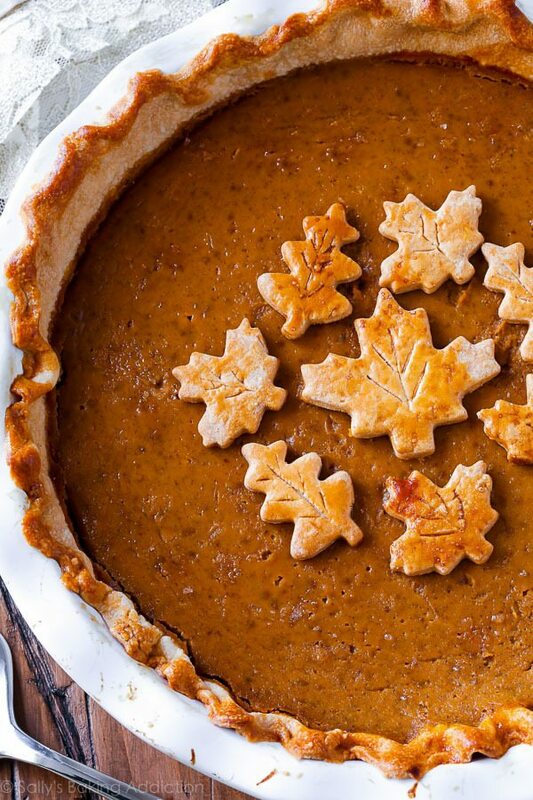 So with the extra dough, you can make adorable leaves for decoration on your pumpkin pie. Or any pie, really. I’ve seen the pie crust leaves baked directly on top of the rim of the pie – and I tried that – but was not thrilled with the results. Too much uneven baking. The underside of the leaves weren’t really cooked through and the tops got a little burnt (even through my pie shield). 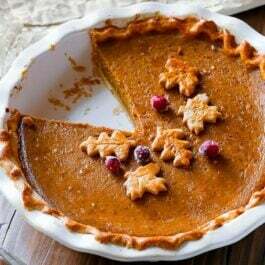 So, to make things easier, just bake the pie crust leaves separately and place them on top of your pie before serving. You can also sprinkle them with a little cinnamon-sugar right before baking. I was going to do that, but I forgot. My leaf cookie cutters don’t have “veins” so I made leaf veins myself using a sharp paring knife. It’s tedious, but if you want authentic looking leaves you can go ahead. Don’t worry if your veins aren’t perfect. That’s a weird sentence. My directions for the leaves are in the print-out recipe above. Let’s talk about those sugared cranberries! I like to use them on pumpkin pie because they give a vibrant, fresh pop of color to the very brown and very orange pie. Plus, they’re tasty. And so festive. Simply prepare a sugar syrup, let the cranberries soak in the syrup overnight, drench in sugar (so dentist-approved) and let dry for a couple hours. My recipe for sugared cranberries is in the print-out recipe above, too! Let me know if you try my pumpkin pie. Happy baking!